This walk is on a beautiful part of the Cornish coastline at its border with Devon and is mostly on the South West Coast Path. The walk starts and finishes on the coast south of the small village of Millbrook. From the parking area the walk makes its way through fields to Millbrook and then follows Millbrook Lake to Cremyll and Mount Edgcumbe. If you do not want to drive over the Torpoint Ferry, the walk can be started from the Cremyll. The Cremyll Ferry can be caught at Stonehouse on the Plymouth side of the River Tamar. 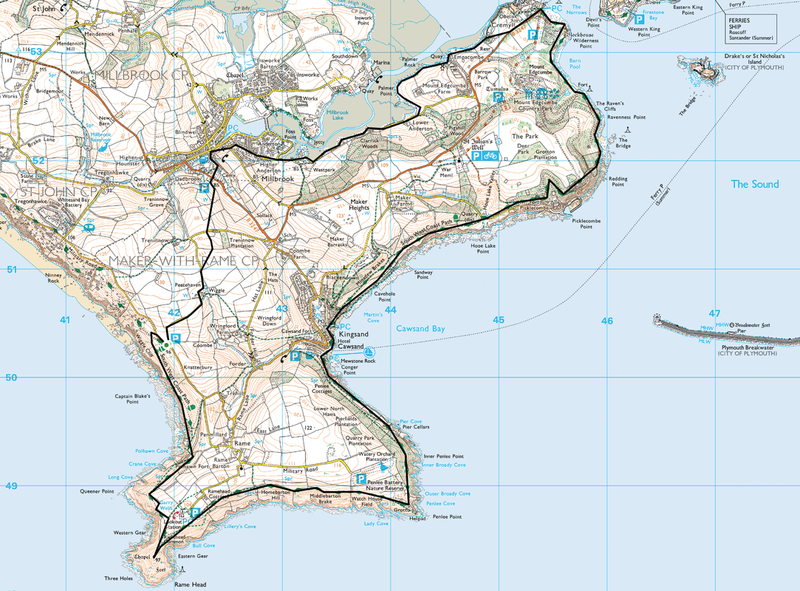 From Mount Edgcumbe there then follows a delightful ramble along the Rame Peninsula passing Fort Picklecombe and arriving in the lovely twin villages of Kingsand and Cawsand where there are plenty of places for refreshment. The walk continues around the Peninsula to Rame Head where the lovely St Michael's Chapel sits on the headland. At nearly 12 miles this is a long walk but worth taking your time over as on a good day the views out to sea and over to Plymouth are superb. Millbrook in the foreground with Torpoint behind. Devonport, a suburb of Plymouth can be seen to the right. Just outside Millbrook we found this charming entrance - unsure what it is.